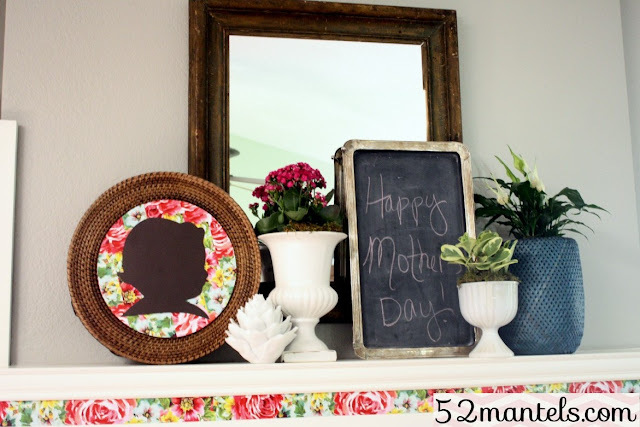 52 Mantels: Mother's Day Mantel+ Reveal+ An Opportunity! Mother's Day Mantel+ Reveal+ An Opportunity! 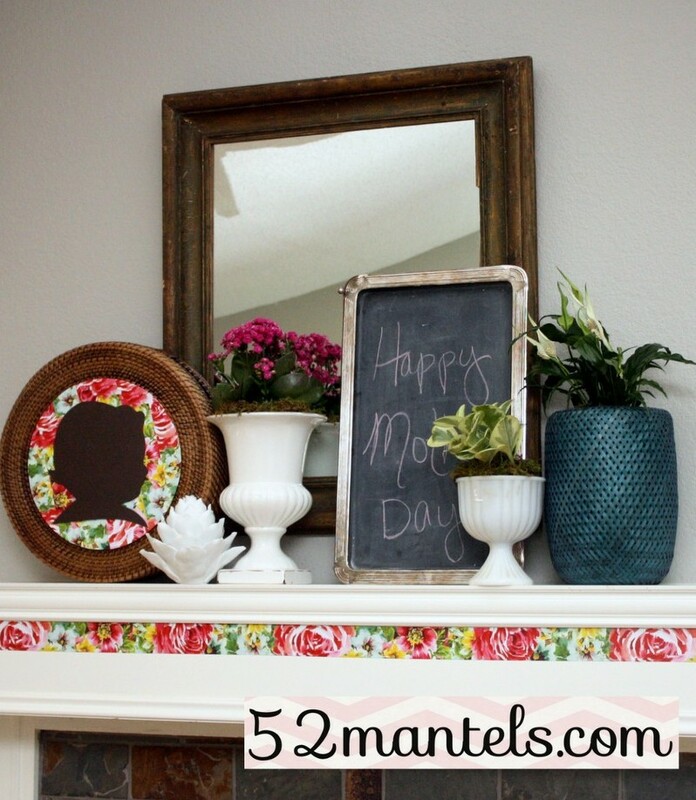 Happy Mantel Monday! Mother's Day is less than a week away, and certainly my mantel can't help but reflect that. It was destined to celebrate either Mother's Day or Nurses' Day..and, well...who wants to see a Nurse-Themed Mantel?! That's what I thought. So, Mother's Day it is! The first thing I must talk about is my floral trim. Less that $3 on clearance at Jo-Ann's. 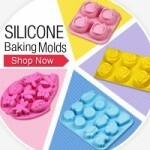 Has anyone seen this stuff? It's in the section with the wall vinyl decals. It's kind of like adhesive backed scrapbook trim, but it feels glossy and removes easily like vinyl. It's pretty cool stuff, especially for a chick who likes to change things up a lot (like, say, every week for 52 weeks). Because my daughter can't use scissors yet (what a baby! ), I made myself a little Mother's Day gift. A sweet silhouette of my little honeypie. And, I mounted her sweet silhouette on a round background, for an unexpected twist. I'll give the tutorial tomorrow! Easy-breezy. For the plants, I simply dropped potted plants into various containers and vases and then covered the evidence with moss. So simple. I added a chalkboard message and that's that. A Mother's Day mantel that makes this momma smile! Here's how it'll work. I'll gather paper products (cardboard? paper mache? napkins? newspaper? decorative paper? toilet paper? who knows!) and scape my mantel with it. And, then I'll show you what I come up with on June 11th. Want to get in on the action? 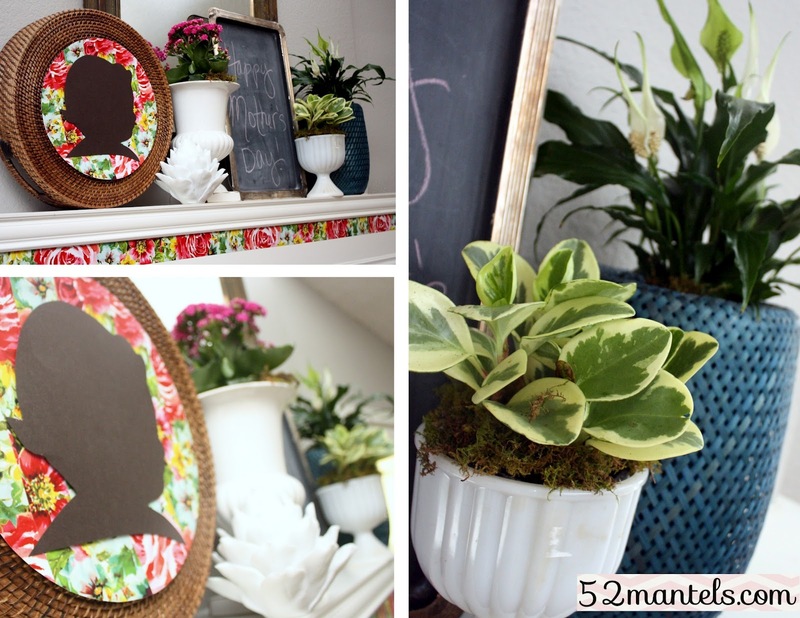 I'm looking for a few willing mantelscapers to join the challenge and let me reveal YOUR 100% paper mantel decor on June 12th (hello guest post opportunity!). Email me if you are interested! So beautiful, Emily! That vinyl trim is pretty cool. So perfect for Mother's Day. ...And Emily Does it AGAIN! GREAT Mantel, as always! 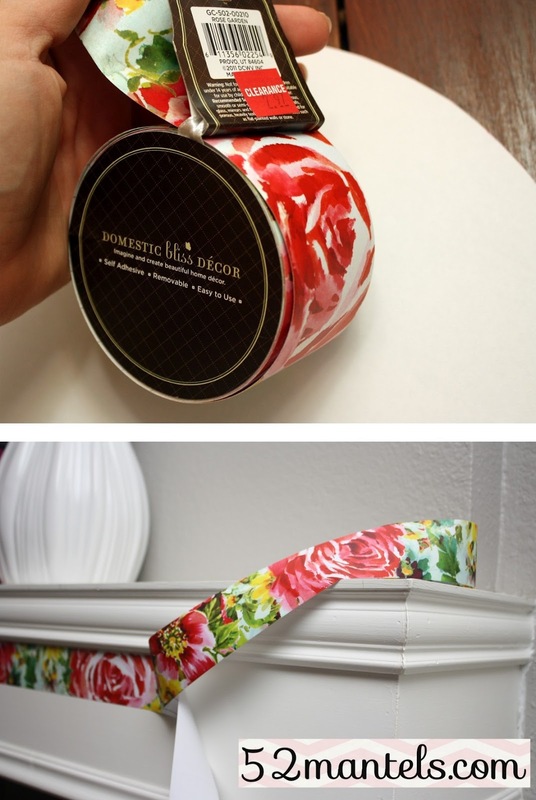 love the use of that tape! So pretty! Beautiful! I had no clue they made tape like that! 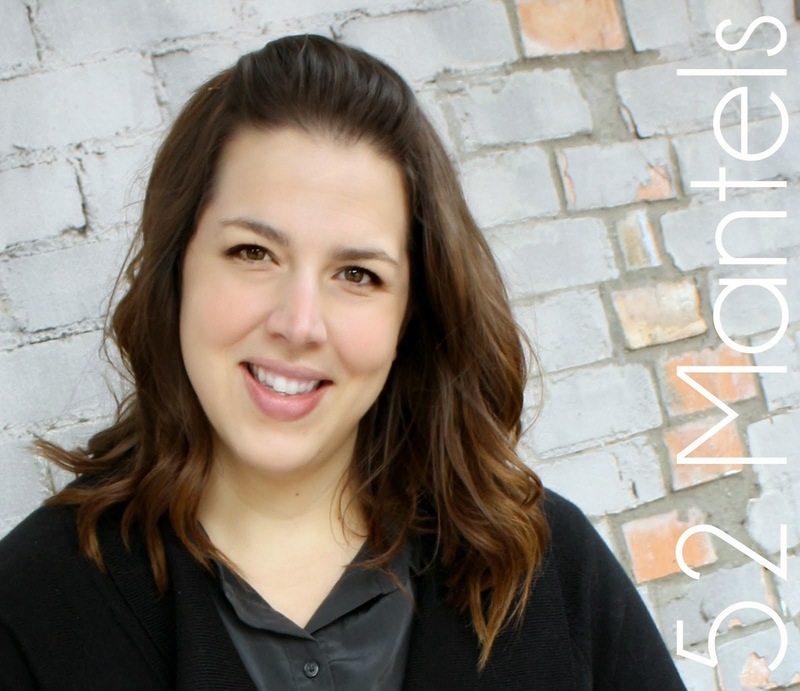 Too bad that little baby can't use scissors - she could join your paper mantel challenge! Love the theme - but you could have single-handedly brought nurse's day into the mantel spotlight! Maybe next year! Can't wait to see lots of TP dangling from your mantel! That is a perfect mantel for Mother's Day! BRAVO! Just change the note on the board and it can still be a perfect mantel. Second, I am totally intrigued by this paper products mantel idea. I don't have a mantel, I don't even really have a fake mantel...but I am so intruiged by the idea I might just have to get in on the fun. :) I can't wait to see yours! i'm SO EXCITED to play along! it's going to be a fun challenge! thanks Emily!